Fratta Todina , the original name of Tudernum was given by Plinio to this village, which is one of the smallest of the entire region. 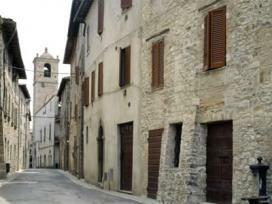 For its favourable position, the village, was sought by Todi and Perugia, which were interested in controlling the lands beyond the Tevere river. Although Perugia won on 1310 the Montemolino battle, Fratta Todina always stayed under the influence of Todi and its bishop. On 1416 Fortebraccio da Montone, fortified the castle in order to make it safer for his troops. On XVI century, the bishop ordered the construction of a beautiful residencial house, which contributed to make of Fratta Todina a very appreciated place for the visits of the noble families. Not far from the city center there is the Convent of Spineta, one of the most evocative places of the francescan tradition.